Metro Art Docent Council founder and coordinator Barbara Lashenick. 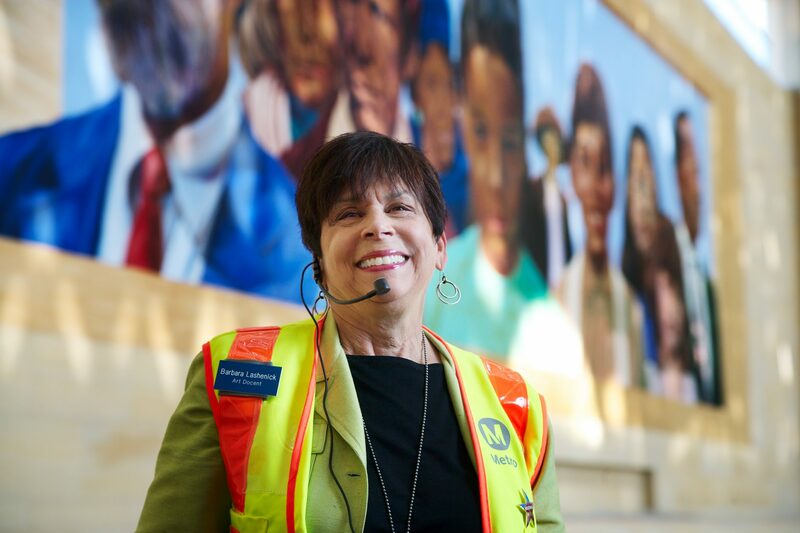 Metro Art has a long track record of working with seniors and will have a presence at Metro’s On the Move Rider’s Club’s 1st Annual Older Adult Expo to be hosted at Union Station today. Interested participants will be treated to a brief presentation about the art program and a guided tour of The Makers photographic portrait exhibition at Union Station. There will also be information about the range of free offerings by Metro Art. Metro Art has for some time engaged seniors through its Docent Council, which was founded in 1999 by Barbara Lashenick to train volunteers to provide free tours of artworks in the Metro system. Today, under the banner of Metro Art Moves, the docents range in age from those in their twenties to retirees — with at least one octogenarian who has been a member since the program’s inception! The program has expanded in recent years to include tours of historic Union Station, tours in Spanish and special holiday celebrations such as Valentine’s Day and Day of the Dead tours featuring guest artists and cultural experts. Many of the thousands of tour attendees are seniors; bookings for large groups from retirement communities are most welcome. The Makers photographic exhibition at Union Station, which features many older adult artists commissioned by Metro. A step back in time with Metro Art Presents’ Film Noir at Union Station series, kicking off with the classic “Union Station” on Oct. 7. Hear from some of The Makers at an Artist Conversation on Oct. 20. Book a tour by calling (213) 922-2738. Feeling less mobile? Visit our website metro.net/art to listen to artist interviews, watch award winning videos and more!